No freshwater fish has a more northerly distribution and no salmonid a wider distribution than the Arctic char. Restricted in the north only by perpetual ice and in the south (below about the 45-degree latitude line) by warmth, anadromous and landlocked forms range across North America, Siberia, Europe, Iceland and Greenland. As the last glacier retreated, streams and lakes of what are now the contiguous United States were invaded from the sea by anadromous fishes such as salmon, smelt and char. As recently as 5,000 years ago, when the ice sheet still lingered in Maine, Arctic char abounded in the Northeast. Today you’d be more likely to encounter an Atlantic walrus or a polar bear in New England than an anadromous Arctic char. But that doesn’t mean the species isn’t present. At their southernmost range on the planet, 12 or 11 (one is in doubt) relict populations persist in deep, cold lakes in Maine. The last populations in New Hampshire and Vermont were lost in the 20th Century when stocked lake trout preyed on them, competed with them and eventually hybridized them out of existence. It’s misleading to refer to “the Arctic char” because forms throughout the northern hemisphere and even in Maine (where they’re called blueback trout) are so morphologically divergent—more so, for example, than some of the genetically divergent cutthroat trout we classify as “subspecies.” Few if any fish taxonomies are more complex, clouded or controversial. While there is no general agreement as to classifications, ichthyologist Robert Behnke argues that North American Arctic char should be divided into three subspecies: Salvelinus alpinus oquassa of Maine and southeastern Quebec, probably representing the first evolutionary line of Arctic char on the continent established before the last glacial epoch; S. a. erythrinus of the high Arctic including wide swaths of Siberia; and S. a. taranetzi of Alaska and the Chukchi and Kamchatka peninsulas. In Alaska most char live their whole lives in fresh water. In Scandinavia, Iceland and Great Britain multiple forms inhabit the same lakes. Most landlocked char that evolved in New England and southeastern Quebec were reef spawners, but the form native to Maine’s Rangeley Lakes—last seen in 1904—was a stream-spawner. The large char of Floods Pond (the water supply for Bangor, Maine) are piscivorous and grow to more than 20 inches. The invertebrate feeders of Maine’s Green Lake are apparently dwarfs, rarely making it past seven inches. In Maine’s Gardner Lake there’s even a snail-eating char. Leading an intensive study of America’s last native populations of sub-Alaska Arctic char has been Dr. Michael Kinnison of the University of Maine. The work of Dr. Kinnison and his students provides additional evidence, if more were needed, that Maine’s Arctic char are priceless, national treasures that we need to get serious about protecting and restoring. And, as the most southerly Arctic char on the planet, they’re poster children for the threat of climate change. Yet with the exception of Trout Unlimited, the Sportsman’s Alliance of Maine (SAM) and a few native-fish advocates, the general public and even the angling community at large seem singularly unmoved and unconcerned about Maine’s char. Tragic lessons of the past go unheeded. The most graphic of these lessons occurred in the Rangeley Lakes of western Maine, where superabundant dwarf char had provided forage for the race of giant, hump-backed brook trout, now largely extirpated. In the summer of 1863 Wall Street broker and Rangeley angler George Page—born before John Voelker’s admonition that “any fisherman who will tell on the trout waters that are revealed to him possesses the stature of a man who will tell on the woman he’s dallied with”—spilled his guts to the world. On his return to New York with eight char-fattened Rangeley brook trout, which together weighed 52 pounds, Page made a big show of presenting the three largest to editors of The Evening Post, The New York Times and The Spirit of the Times, all of which ran effusions about the fish bonanza to the north. But that kind of fishing wasn’t good enough for Maine. In an effort to improve on nature, the state stocked smelt, which chowed down on the fry of the native brook trout and Arctic char and then competed with the surviving char for zooplankton and other small invertebrates. Introductions of landlocked salmon hastened the char’s decline. The large, piscivorous char of Lake Sunapee (known as goldens or white trout) suffered a similar demise at the hands of unsatisfied meddlers. Dr. John Quackenbos, a distinguished 19th Century angler and writer, held that “white trout” were twice as sporting as brook trout and judged the ultimate angling experience to be trolling for them “from a sailboat with a greenheart tarpon rod, 300 feet of copper wire of the smallest caliber on a heavy tarpon reel, and attached to this a 6-foot braided leader with a Buell’s spinner, or a live minnow on a stiff gang.” In 1885 his friend Col. Elliott Hodge, the state fish and game commissioner, wrote him about seeing “hundreds of which will weigh from 3 to 8 pounds each” hovering over the spawning reef at the entrance of Sunapee Harbor. In an effort to improve on nature, the New Hampshire Fish Commission stocked landlocked salmon in 1867, smallmouth bass in 1868, smelt in 1870, whitefish in 1871, walleyes in 1876, Arctic char from the Rangeleys in 1878 (some of the fish caught by Quackenbos and observed by Hodge were probably these), round whitefish in 1881, brown and rainbow trout in 1888, Chinook salmon in 1904, Montana grayling in 1906 and coho salmon in 1909. It’s not known when lake trout were introduced to Sunapee, but they began showing up in the 1930s and promptly converted the remaining char to mongrels. Fast forward to the late 1980s when, incredibly, the Maine Department of Inland Fisheries and Wildlife still allowed angling with live smelt and other baitfish in Arctic char water. Big Reed Pond—never stocked, embraced by one of the last old-growth forests in the East and whose watershed is almost entirely protected by The Nature Conservancy—had provided superb native brook trout and Arctic char angling. The nearest road is a mile away. At least three times a week, Gary Corson—then a fishing guide, now representing the Kennebec Valley Chapter of Trout Unlimited and serving on SAM’s Fishing Initiative Committee—would fly his clients into Big Reed. Today, Big Reed char may be extinct in the wild, and the pond’s brook-trout population is essentially kaput. To its credit, the Maine Department of Inland Fisheries and Wildlife is taking restoration very seriously. It was able to trap nine Arctic char from Big Reed and has contracted with a private hatchery to hold and breed them. At this writing there are only two progeny. In the fall of 2008 one fish produced a lot of eggs, but for some unknown reason they died a few hours after fertilization. It’s not clear that there are enough fish to preserve a genetically viable stock. But, if necessary, char can be brought in from other ponds; and within a few generations the Big Reed strain would likely predominate. Of course, restoration of Big Reed’s native fish fauna depends on the department’s ability to poison out the smelts. Biologist Frank Frost, the point man for Maine’s char effort, says his agency doesn’t have the funds but that he expects they’ll eventually become available. It’s a list not of “options” but of four wrong-headed non-solutions together with the only existing chance for recovery—Option 4. Frost and his agency know this. But because of the public’s irrational fear of any and all fish poisons, department staff apparently believe they need to tread lightly. At least the department is fortunate in having to deal with The Nature Conservancy. I confess that I approached my interview with TNC’s Maine conservation planner, Josh Royte, with trepidation. And I came away with some. It was apparent to me that TNC, like most environmental groups, doesn’t understand that the only tools for saving imperiled fish like Big Reed char are safe, short-lived organic piscicides—rotenone and, on the rare occasions it can be obtained, antimycin. But Royte also made it clear that TNC is open-minded and passionately committed to restoring the pond’s native ecosystem. Still, TNC has embarked on an arduous and utterly redundant study of non-existent alternatives to piscicide. “We’re very nervous about reclamation,” Royte told me. “So we asked the Department of Inland Fisheries and Wildlife to write up a plan, which took a couple years. We reviewed the plan and recommended strongly that they reach out for peer review for finding alternatives and expert opinion. We knew there wasn’t enough time for us to get a good, solid peer review of what the best options are. So we’re looking hard for other ideas of what we can do.” Unlike some environmental organizations, TNC at least is willing to learn about rotenone. It just doesn’t understand that all the information is already out there and that rotenone has been used in fisheries management for 80 years without sickening a single human or permanently affecting a single nontarget population except to release it from competition, predation and genetic swamping by aliens. All the re-studies and duplicative peer reviews may take more time than Big Reed char have. That’s why, in my opinion, it would have been wiser for the department of inland fisheries to confront TNC and the public with the truth than to offer false hope with what it calls non-chemical “options” but what its own biologists, and for that matter anyone remotely familiar with fisheries management, recognize as quackery. Even as the tragedy was unfolding on Big Reed, bucket biologists were creating another at Wadleigh Pond, which had been providing the best Arctic char fishing in the state. Alien smelts were discovered there in 2006. Like Big Reed, Wadleigh is on the small and shallow side for char water. Frost reports that its char are already in decline. There is no plan to evacuate survivors or to use rotenone to kill the smelts. The department says it doesn’t have the funds. Native-fish advocates argue that the department could divert funds from wasteful and misguided programs such as splake production. Maybe so, but these advocates need to redirect some of their bile toward the public and the legislature, both of which appear perfectly content with a funding system that has made effective fish-and-wildlife management impossible in states like Maine (i.e., most states), where virtually all revenue comes from fishing, hunting and trapping licenses and federal excise taxes on guns, ammo, hunting equipment, fishing tackle and motorboat fuel. If all state residents contributed to fish-and-wildlife management in Maine (as they do through sales taxes in Missouri, Arkansas and Minnesota), wild char would now be recovering in Big Reed and Wadleigh, and populations in the other 10 native char ponds would be well-studied and surveyed. Little is known about those populations. And in Green Lake, where alien lake trout are being stocked on top of Arctic char, it seems the department wants to keep it that way. “They don’t really want to know too much about how the two species interact,” remarks Dr. Kinnison. Interestingly enough, char co-evolved with smelts and landlocked salmon in Green Lake, so they’ve done well with both. Maybe they can also tolerate lake trout over the long haul. And maybe they cannot. Other than reclaiming Big Reed and Wadleigh and keeping hatchery lake trout out of Green Lake, there’s not a lot the department can do to “manage” Arctic char. But there are a few things it can do to engage the public. Except in Floods Pond, off limits to all angling because it’s a public water supply, char count toward your brook-trout limit. The physical difference between a brookie and an Arctic char is striking; but the assumption has been that Maine anglers can’t distinguish between the two species. If that’s not true, it’s a gross insult; and if it is true, the department needs to crank up its education effort. It is far more difficult, for example, to distinguish a hen mallard from a black duck or a landlocked salmon from a brown trout, but sportsmen who can’t tell the difference run the risk of getting busted. Char are deepwater fish, difficult to catch on flies or lures, and most anglers ignore them for the far more accessible and generally larger brook trout. Roland Martin, commissioner of the Maine Department of Inland Fisheries and Wildlife, may have it right when he proclaims that no-kill and artificial-lures-only regs for Arctic char are “not biologically necessary.” But there’s a sociological necessity. Clinging to the old regulations sends the wrong message, leading the public to believe that these fish are mere evolutionary curiosities rather than beautiful, unique jewels desperately endangered by alien-fish introductions and global warming. By the same token, it’s doubtful that the char of Bald Mountain Pond are much threatened by the hatchery brook trout the department superimposes on them. Maine char and brook trout co-evolved, and hybridization has never been a threat. On the other hand, there’s always the danger of introducing pathogens and parasites; and, again, dumping rubber trout on top of one of only a dozen native char ponds left in the contiguous states sends the wrong message. Ponds containing heritage fish can’t be stocked and can’t have a history of being stocked. In following the letter of the law the department went to a silly extreme when it recommended that Floods Pond, Rainbow Lake and Black Lake be stricken from its proposed list of 10 heritage char waters merely because stocked brook trout might migrate into them. But at least it was okay with seven heritage waters. So far the legislature—kowtowing to hook-and-cook, rubber-fish enthusiasts among its constituents and in its own ranks—is not. I see only one hope for Maine’s relict Arctic char, and that’s the Endangered Species Act (ESA). Under the Bush administration ESA protection would have been impossible. Under Obama, it’s a tough sell—mostly because there is an ugly, backward element in Maine that fears and hates federal agencies and federal laws. Witness the caterwauling that followed listing of America’s wild Atlantic salmon. Maine’s then-governor, Angus King, filed an unsuccessful lawsuit and proclaimed that the feds had “betrayed” his state and were “trifling with people’s lives.” Property-rights guru Jonathan Reisman, an associate professor of economics and public policy at the University of Maine-Machias, circulated a statement accusing the Feds of “sodomizing” his state. The aquaculture industry, the forest-products industry, the blueberry industry and just about every politician in Maine warned that the listing would bankrupt the state. None of the ruination prognosticated by Maine’s ESA bashers has occurred. And, while the fate of the nation’s last wild Atlantic salmon remains in doubt, at least they now have a fighting chance. ESA listing for Maine Arctic char would unleash a torrent of federal money that would allow prompt reclamation of Big Reed, Wadleigh and any other ponds that are, or might become, infected with smelt or other alien fish. It would end pollution of Green Lake with hatchery lake trout and keep hatchery brook trout out of Bald Mountain Pond. It would protect watersheds from rash development and predatory logging. It would provide better enforcement and subject bucket biologists to major criminal penalties. Finally, while threatened classification would allow continued char angling, it would mandate the no-kill regs that should have been in place all along. A respected, politically influential organization needs to step up fast and petition the U.S. Fish and Wildlife Service for threatened status for America’s last sub-Alaska Arctic char. That would be Trout Unlimited. 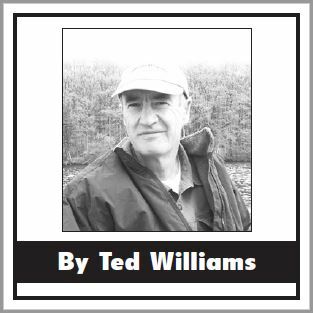 Ted Williams has written about conservation for Fly Rod & Reel magazine for more than 20 years. Follow his blog at flyrodreel.com.